Gen. Mugisha Muntu delivers his concession speech at Namboole last month. File photo. KAMPALA–The former FDC leader, Gen Mugisha Muntu, is kicking off his consultation meetings on January 15, at national and regional levels. According to the press statement released on Sunday evening, the former bush war hero said they will not superimpose an already determined outcome to these consultations. “Instead, we plan to move ahead in the hope that we all will come out of the process stronger, more united in purpose and clearer on the path, we each should take,” the statement reads. Muntu also said as a result of the November presidential election as well as long standing issues, which have remained unsolved, they will consult widely within the party. “We shall also consult other stakeholders about the best way those of us that firmly believe in the idea of institutionalizing our country’s politics can contribute to a better Uganda,” he added. Muntu’s consultation plan come hot on the heels of a meeting he had with new FDC president Patrick Amuriat. Amuriat, the former Kumi Municipality MP, defeated Muntu, in a highly contested race, with the backing of Dr. Kizza Besigye, the former party presidential candidate. Muntu’s group was uncomfortable with Besigye backing Amuriat. But Besigye, who is a bush war hero, defended himself saying Amuriat invited him. During the Friday meeting, Amuriat and Muntu discussed the contradictions, though much was not achieved. In a statement issued by Muntu, he said he will do everything to ensure that Amuriat gets all the space he needs to achieve for the party. Amuriat asked his supporters and members of FDC after the meeting to act with restraint and allow the healing process to proceed soberly. In his statement, the former army commander said during the consultations, certain issues will be discussed, among which, will be which strategies to adopt in order to uproot the NRM government from power. “Two weeks ago, delegates chose defiance approach but as a Christian and a leader, I firmly believe in speaking the truth, especially when it is hardest. Majority vote defiance but what happens to members who believe in a multi-prolonged approach?” he asked. 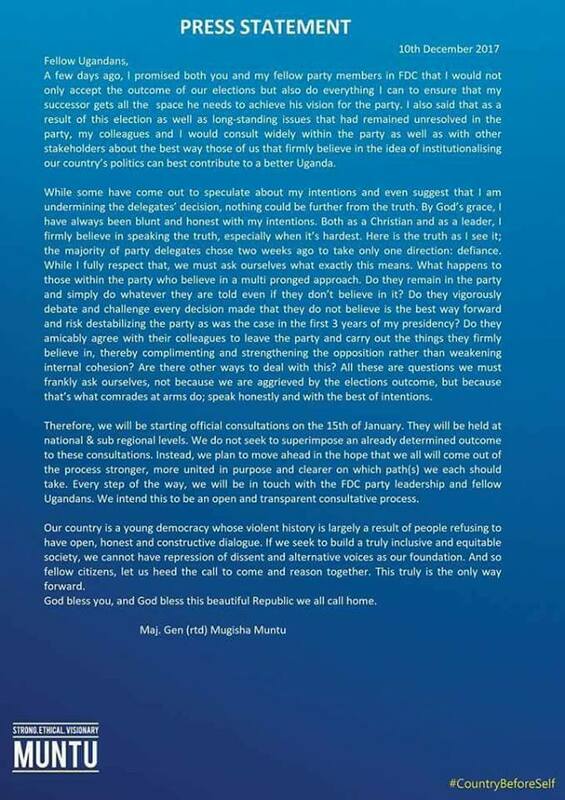 On Wednesday this week, while chairing FDC NEC meeting for the first time, Amuriat assured members that he will solve the contradictions, which were seen during the party presidential campaigns. Sources, who attended the NEC meeting, told PML Daily that the hall members are hopeful that Amuriat will move the party in a right direction. Gen Muntu’s statement on nationwide consultations.